The opening weeks of the year 1665 were particularly cold, and the sub-zero temperatures had discouraged the King of England, Charles II, from writing to his sister Henrietta in France. "She ascended the thrones of England, Scotland and Ireland in 1702, at age thirty-seven, Britain’s last Stuart monarch, and five years later united two of her realms, England and Scotland, as a sovereign state, creating the Kingdom of Great Britain. She had a history of personal misfortune, overcoming ill health (she suffered from crippling arthritis; by the time she became Queen she was a virtual invalid) and living through seventeen miscarriages, stillbirths, and premature births in seventeen years. By the end of her comparatively short twelve-year reign, Britain had emerged as a great power; the succession of outstanding victories won by her general, John Churchill, the Duke of Marlborough, had humbled France and laid the foundations for Britain’s future naval and colonial supremacy. While the Queen’s military was performing dazzling exploits on the continent, her own attention—indeed her realm—rested on a more intimate conflict: the female friendship on which her happiness had for decades depended and which became for her a source of utter torment." 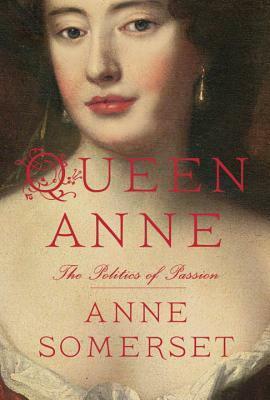 Despite having no interest in this period in history or in this particular monarch, once I cracked open this book I rather quickly found myself immersed in Anne's story (take that whichever way you choose). I received a copy from a Goodreads giveaway many month ago, and initially I was sorry that I didn't take a look at this engaging biography sooner. That said, I never finished the book because I kept starting other ones that appealed to me more. It started to get bogged down, and probably because I wasn't interested in this particular monarch I felt like there were better things to be reading. It's not a bad biography though; a lot of the politics involved was quite interesting to read about, and parts of the book were downright suspenseful to a point. For anyone interested in British royalty in general this is a worthy book to add to your shelves. From the parts I read, Somerset is detailed and accurate, drawing from many primary sources.